indicates the thermocouple has failed. Replace the defective thermocouple. To clear the error, press any key. Errd Displayed whenever the kiln temperature is 100°F (38°C) above the traveling set-point, which is the current desired temperature in the kiln. The traveling set-point will increase or decrease according to the programmed rate. Displayed whenever the kiln temperature is rising during an up ramp slower than 15°F/hr. (9°C/hr) If this rate continues for 8 minutes the firing will be stopped. Err1 may be an indication that the elements are worn or that a relay has stopped working. Displayed whenever there is a power interruption that is long enough to stop the firing. If the power interruption is brief, the kiln will continue to fire when power is restored; in this case, there will be no indication of a power failure. To clear the error, press any key. 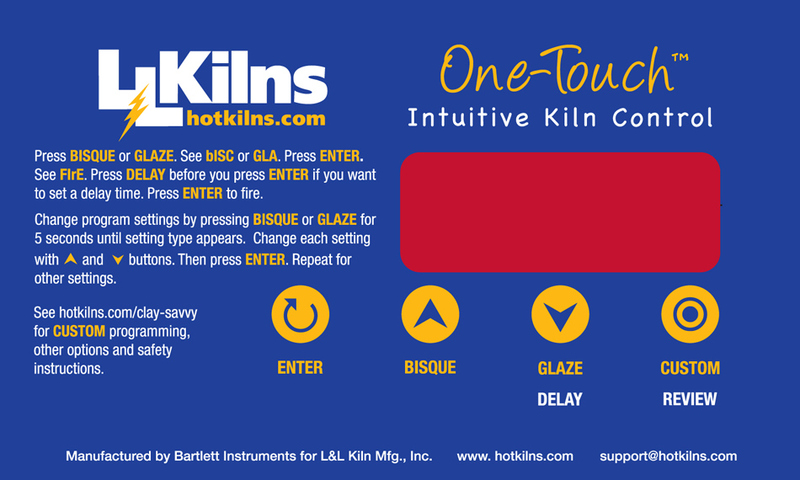 Displayed whenever the kiln temperature is decreasing during a down ramp slower than 15°F/hr (9°C/hr). If this rate continues for 8 minutes the firing will be stopped. ErrF may be an indication that a relay has stuck in the on position.